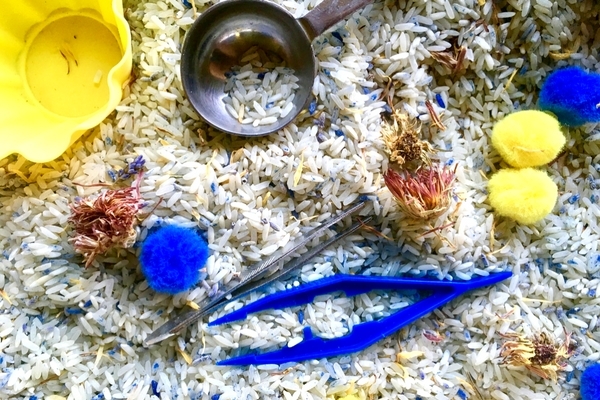 Sensory bins are so much fun for toddlers (well kids of all ages really)! It’s like bringing a sandbox inside to explore and play! You can incorporate sensory play into all aspects of life, including helping to calm and soothe. 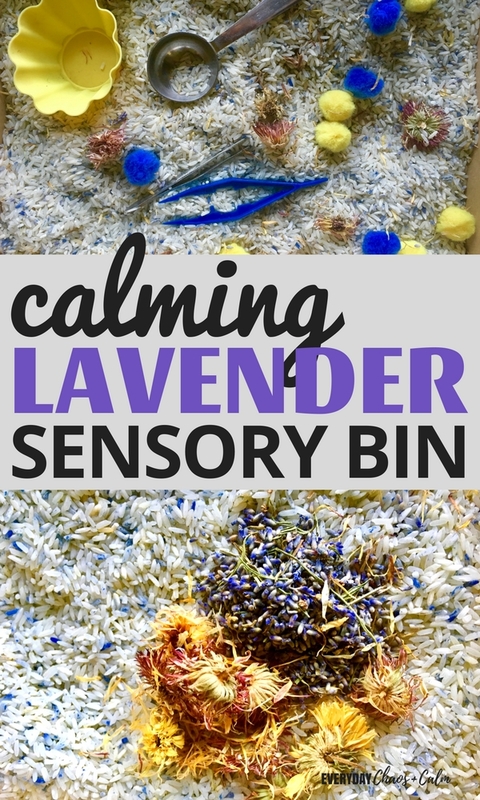 This calming lavender sensory bin has calming herbs and oils, plus the rice is smooth and soothing to the skin. It’s the perfect activity for a sick child, a over-tired toddler, or anyone who has just had a bad day! Start by pouring your rice in a gallon size ziploc bag. If you are using food dye, add a couple of drops and seal the bag, Give it a really good shake and rub the rice so that the dye is evenly dispersed. I wasn’t going for a bright solid color, more of a lavender hue. Then add in just a couple of drops of Lavender Essential Oil- a little goes a long way! Seal and shake the bag again. Now pour your colored and scented rice into your chosen bin. For this sensory bin, I wasn’t going for size. I wanted a smaller, table top bin that could be used for quiet play. Our bin was about 12 x 10 inches in size. Now add your herbs. The lavender is a must, the calendula is optional. Both are very easy to grow, so we always have both on hand. You can purchase dried herbs online if you don’t have them on hand at home. Both of these herbs offer color, texture, and scent to the sensory bin. 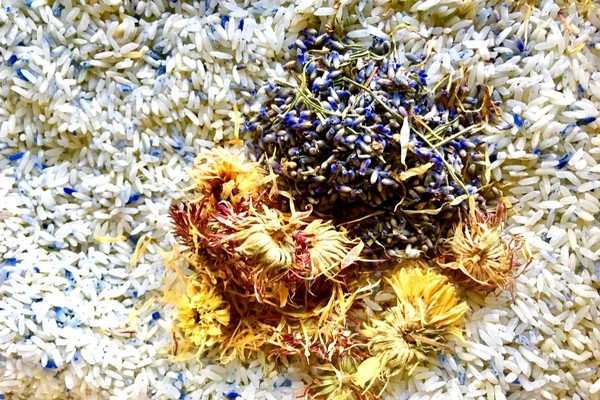 Let your child mix the herbs into the rice- the scent of lavender will be released, which is very calming. 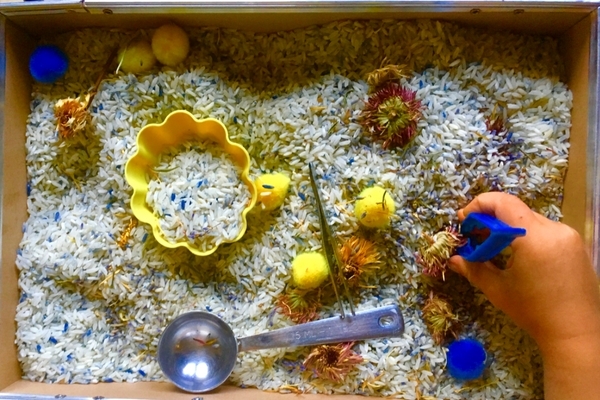 Now add your extras- scoops, bowls, and tweezers are a staple in all my sensory bins. They are great for pouring and transferring- both good fine motor skills. I also added pom-poms for more variety. Stick with soft, calming objects that don’t encourage the child to smash or get too excited in play. Of course my son brings his cars into any sensory bin we make, so his tractors and trucks made an appearance as well!